The Report pane shows reports of your plan. It is not possible to make changes to the plan from this pane. Click the Terms... button to change the words used in the report (e.g. to another language). Note that not all text can be replaced in all reports. You can copy the contents of the whole pane to the clipboard as plain text and HTML using Edit> Copy. Use right-click and Copy to copy selected text to the clipboard. You can export the pane as an Excel CSV, plain text or HTML file using File> Export... and selecting report to text/CSV/HTML file. Select Excel CSV file, Text file or HTML file from the Save as type drop-down in the Export window. Plain text may be useful for emailing to your caterer. HTML preserves the layout and is useful for web pages and other HTML-aware applications, such as Microsoft Word. CSV files can be opened as Excel or Numbers spreadsheets. The summary report gives overall statistics for your plan. The trouble shooting report checks for the following 45 potential issues in your plan. If there are more than 100 results for any one issue, only the first 100 will be displayed for brevity. For the purposes of the report seated 'next to' means the seat to the immediate left or right and seated 'near to' means on same table, table section (for E-shaped tables) or row of seats. not shown if displayed in "All 'Next to' and 'Near to' Proximities unfulfilled"
Click the Choose plans... button to select which plans to include in your report. The Choose plans window will appear. The maximum number of plans depends on which Edition of PerfectTablePlan you have. In the Professional edition you can select from the Match by drop-down list depending on whether you want to match guests between plans by their ID or name (Title+First name+Last name, case is ignored). In the Advanced edition guests are always matched between plans by name. 2.You imported the same ID for the same guest to multiple plans. Click Go to create the report. Check the detailed check box if you want to include a detailed report on each guest (this can make the report very long). Set Show guests sat depending on whether you are interested in guests sat at the same table (table section for E-shaped tables) or just guests sat next to/opposite each other. Set the times value to set the threshold for how many time a pairing has to occur before it is displayed. For example, to show guests that are sat on the same table more than once set Show guests sat to same table/section and times to >1. Proximity is shown by colour (see the key in the report). Potential problems are highlighted in yellow, the greater the issue the darker the yellow. 1.Mr Andrew Adams and Mrs Nikki Adams were seated next to each other in seatings 1,2 and 3. The proximity for all 3 seatings was 'Next to' (denoted by the red background colour). 2.Mrs Rose Atwell sat on the same table as (but not next to or opposite) Mrs Nikki Adams for seating 3. Their proximity was neutral. 3.Mrs Michelle Blaire was sat at the same table as (but not next to or opposite) Mrs Rose Atwell for seatings 1 and 2. The proximity for seating 2 was 'Not next to' (denoted by the grey bakcground colour). The yellow background colour of the cell shows that there is a potential issue (guests with 'Not next to' proximity sat at the same table). 1.Mr Andrew Adams and Mrs Nikki Adams were seated next to (denoted by a '*') each other in seatings 1,2,3 and 4. The proximity for all 4 seatings was 'Next to' (denoted by the red colour). 2.Mrs Rose Atwell sat on the same table as (but not next to or opposite) Mr Colin Ayer for seating 3. Their proximity was neutral. 3.Mrs Michelle Blaire sat next to or opposite Mr Colin Ayer for seating 4. Their proximity was neutral. 4.Mrs Cynthia Brown was sat at the same table as (but not next to or opposite) Mr Andrew Adams and Mrs Nikki Adams for seatings 1 and 2. The proximity for seating 2 was 'Not next to' (denoted by the grey colour). The yellow colour of the cell shows that there is a potential issue (guests with 'Not next to' proximity sat at the same table). Display is the guest property you wish to display, e.g. the meal choice. By is how you want to group the results, e.g. by table. Choose N/A if you don't want to group the results. 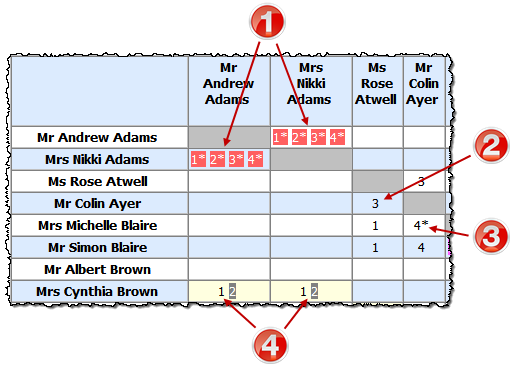 For allows you to specify which guests you wish to include in your report. For example, if you have a custom field 'amount owing' and you want a total of how much money is owed by each group for all the people that have accepted their invitations set Type to 'Detailed summary', Display to 'amount owing', By to 'Group' and For to 'RSVP accepted'.